In England the vast majority of colleges are members of the Association of Colleges (AoC), an employers' organisation which negotiates with UCU and other recognised trade unions (UNISON, ATL, AMiE, UNITE and GMB) in the National Joint Forum (NJF) to produce recommendations on pay and conditions for individual colleges to adopt. There is particular frustration among City of Wolverhampton College members after the employers refused an offer from UCU to meet through arbitration experts Acas to try and avoid strike action following suspension of planned action in March. Strikes still on at five colleges - West Thames College, South Bank College, Croydon College, Bradford College and Harlow College - while progress in talks sees action suspended at Bath, Petroc, and City of Wolverhampton colleges. The dispute at Bridgwater & Taunton is now over after members voted to accept a deal that includes the end of graded lesson observations and a 2% pay rise over nine months (1% in April 2019 and another 1% in January 2020). Lower paid members will receive a 5% increase in April 2019. Ten colleges are preparing for a fresh round of strike action on 20, 21 and 22 March: Bath College, Bradford College, Bridgewater and Taunton College, City of Wolverhampton College, Croydon College, Harlow College, South Bank College (Lambeth previously) and Petroc, with West Thames College members walking out on 18, 19 and 20 March. Action at Abingdon and Whitney has been suspended due to progress in talks. New College Swindon members backed a deal on the eve of further action. Seema Malhotra, the MP for Feltham and Heston, said a pay rise is long overdue as she gives full support to West Thames College strikers. Meanwhile, after prime minister's questions UCU has said Theresa May's claim to respect further education does not stand up to scrutiny and will ring hollow with the hundreds of UCU members out on strike over pay this week. Members at Abingdon and Witney College, City of Wolverhampton College and West Thames College have been given a boost ahead of their two-day walkout over pay after local MPs gave their support. Meanwhile strikes at New College Swindon were confirmed after talks between UCU and the college broke down. UCU's further education committee (FEC) officers have recommended 29 and 30 January, and 20, 21 and 22 March as the next strike days so please look out for confirmation over the next week. Last week the Association of Colleges made an offer of 1% on behalf of employers - an insult which does not come close to recognising the work you do and which would widen the gap between your pay and schoolteachers rather than close it: Is a 1% pay rise all you're worth? As members walk out at the six striking colleges - Bath College, Bradford College, Croydon College, Lambeth College, New College Swindon and Petroc - ballots at 26 more institutions* will open. Those ballots close on Wednesday 19 December. UCU has written to six FE colleges to inform them that UCU members will be taking strike action for two days from 28 November, the same day that fresh ballots will open in many other colleges across the country. UCU will provide full support to members in the six colleges (New College Swindon, Bath, Petroc, Bradford, Lambeth and Croydon Colleges) taking this first wave of strike action with hardship payments of up to £75 for each day of strike action taken. UCU's further education officers met this week to discuss last week's ballot results and have recommended that branches that achieved at least a 50% turnout (Bath, Bradford, Croydon, Lambeth, New College Swindon, and Petroc College) should take two days strike action on 28 and 29 November; branches that came close (35% and above) should be re-balloted from 28 November to 19 December; and branches whose turnout was below 35% should hold members' meetings to decide whether to re-ballot. The campaign for a better deal for FE continues. Vice-chair of the further education committee (FEC), Sean Vernell, writes here in TES on why the fight for fair pay is also a fight for the well-being of students. UCU is also asking members in English colleges to take a few minutes to write to your MP asking them to support fair funding - especially after the Westminster budget produced so little. The results of the ballot are now available here. Despite the enormous efforts made by branches and UCU staff very few institutions achieved the 50% turnout required by the law before industrial action is possible. Matt Waddup, UCU national head of policy and campaigns, said 'It is very frustrating that while overall the turnout is the highest we have seen in UCU for a national pay ballot in this sector, this is not enough to take action in the vast majority of institutions. The results will now be considered by UCU's Further Education Committee. Until such time as advised please note that our current dispute remains on. Low pay is at the heart of the sector's problems with recruitment and retention, argues Sally Hunt in the TES magazine, as union members are balloted over strike action. Members in affected branches should expect to receive strike ballot papers over the next few days. To ensure the 50% threshold is reached members are urged to post their ballots back as soon as possible. The statutory notice of intention to ballot has now been served on employers in respect of the 2018/19 pay dispute. The ballot will open on 30 August and close on 19 October 2018. Members in those branches included should look out for their ballot paper in the post from 1 September onwards. 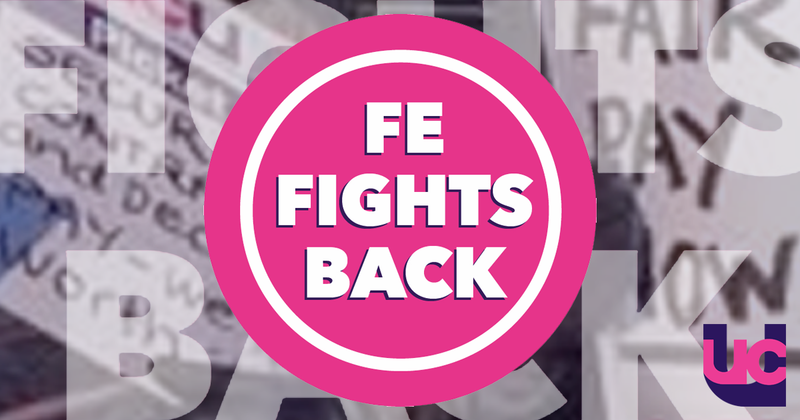 UCU members in FE England have been asked to help the FE fights back campaign by writing to the AoC chief executive officer, David Hughes, ahead of pay talks with the joint trade unions on 13 July. Members are encouraged to use or amend this model email text [1kb] and email david.hughes@aoc.co.uk ahead of the talks. UCU has welcomed a U-turn from the Association of Colleges (AoC) over pay talks for staff in further education. At the start of the month AoC said that it would not discuss a pay claim for 2018/19 while UCU members were still in dispute at some colleges as a result of action taken following the outcome of the 2017-18 pay round. Looking at UCU's strategy for better bargaining in English further education. Information on the 2017-18 national pay round for English colleges. Information on the 2016-17 pay round for English colleges. Information on the 2015-16 pay round for English colleges. Information on the 2014-15 pay round for English colleges. Information on the 2013-14 pay round for English colleges.